The standard is called Google Wave Federation Protocol and is an extension of the already existing and very popular XMPP protocol (Extensible Messaging and Presence Protocol). XMPP is a technology independent standard which includes a protocol called XEP designed to allow any aspect of XMPP to be extended or altered. The XMPP core handles near-real-time, extensible instant messaging (IM) and presence information (e.g., buddy lists), but through its many extensions has expanded into the broader realm of message oriented middleware. 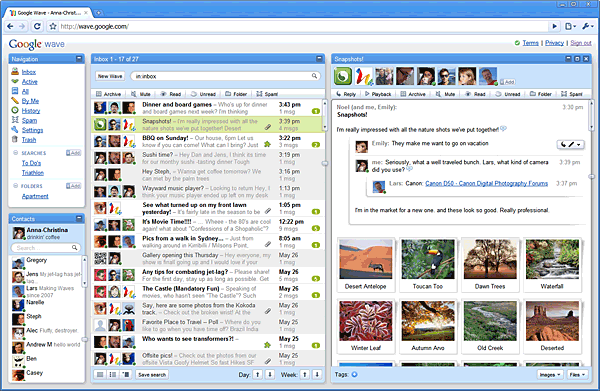 Other extensions include VOIP, video conferencing, file transfer streams and forms. The Wave extension adds the concept of revision-based document storage and collaborative access to the XMPP protocol suite. This is very important because it is essentially all the concepts that make up a wiki and all our forms of communications all unified and encapsulated into an open standard independent of any particular platform or technology. MW:Extension:GoogleWave - some people are quick off the mark! RWW - Wave Is Dead - NOT! Awakening Decentralised Real-time Collaboration - Wave could be back from the dead - opener, distributeder, better! This page was last edited on 12 October 2018, at 08:46.